Pakistan's Parliament has finally passed the much-awaited landmark bill to regulate marriages of minority Hindus in the country. 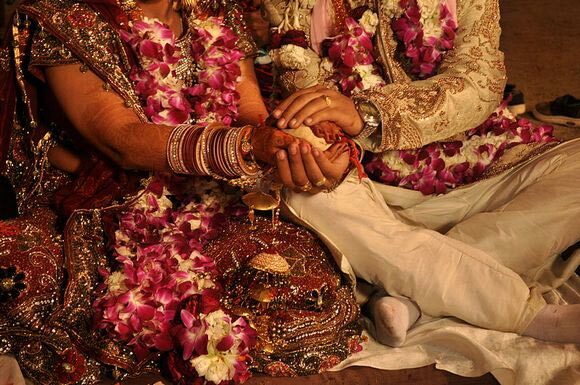 Pakistan's Hindus were set to get an exclusive personal law to regulate marriages after the National Assembly unanimously adopted the Hindu Marriage Bill, 2017, on Thursday. The final text approved by both houses includes the Shadi Parath -- a document similar to 'Nikahnama' in Muslims. The document has columns for the particulars of the bridegroom -- his name and father's name, date of birth, date and place where the marriage is solemnised, temporary address, etc. It also contains the matrimonial status -- single, married, divorced, widower and the number of dependents. Similar details are required for the bride, except for one change. Her mother's must also to be written in the document. The bill was presented in the National Assembly on Thursday by ruling PML-N's Christian lawmaker Kamran Michael, who is also the Minister for Human Rights. The minister said that the incumbent government was committed to protecting and promoting human rights, including the rights of women and minorities. The Hindu marriage bill provides for mechanism for registration of Hindu marriages which includes conditions for contracting the marriage, procedure for dissolution of the marriage and the grounds on the basis of which such marriage can be dissolved. It also provides for the concept of judicial separation where marriage remains intact, but parties are no longer under obligation to cohabit with each other. Moreover, the legitimacy of children born out of void and voidable Hindu marriages has also been protected. After becoming a law, it will be applicable in three provinces -- Punjab, Balochistan and Khyber Pakhtunkhwa -- as the federal government has obtained resolutions from these provinces. The Sindh province has already formulated its own Hindu Marriage Law.